I do have a couple of the small skegs,like RR used, on order. I plan to try them when I get them. I used 3M 5200 Marine adhesive for the skeg on the well plug and it seems to be holding. Would this work well fastening the small skegs directly to the hull, flaming it first? I would go the double sided stuff as recommend earlier, kayak plastic is notoriously difficult to bond to. Finding anything that is proven to work is the way to go. Combining these with the plug skeg should make a difference. Just keep in mind what will fail first if the weight of the kayak is put on the skeg plug if you forget to remove it, which you will. Almost hailed it out today to fit my new seat, ended up not needing to take out, but never thought once about removing the skeg in the drive well. I have to admit I get sort of confused reading thru so many posts and ideas. I get the flaming concept, but what else? Just dual sided tape? Thx WR, I ordered some 3m 5952 today. I have noticed that apparently there is more that one size rudder available? I have no idea which size I have, assume it’s what it came with. Would a larger rudder help? I do have a sail kit, which I haven’t tried yet but definitely plan to once I get a bit more familiar with it. I’m starting to get the hang of pedaling and paddling together, and really like it. Great exercise. large rudders will turn you better, and help track better in strong crosswinds. But if you are paddling and trailing it like a skeg it will be more resistance and make it harder to manoeuvre the kayak with the paddle. I try not to drop the rudder when paddling unless I have to due to this. But yes when used in pedal mode and operating the rudder by hand it is a worthwhile upgrade. That sailing rudder is awesome for pedaling use and sailing. I really don't know why Hobie doesn't make it a stock item instead... but you can save your stock small rudder and try to mount it to the drive well plugs I sent ya. The larger sailing rudder came stock on our 2016 Oasis. I was hoping the skeg mod would improve towing as well and I was recently able to test this out. When towing the Adventure behind our TI, before the skegs were added it would fishtail and crab sideways, ending up at almost 90deg at times to the direction we were travelling. Dropping the rudder helped but it wouldn’t stay locked straight ahead. Dropping, but not down cleating the rudder seemed to work best but it would still ‘tack’ when underway. It now tracks straight as an arrow with no crabbing/fishtailing. Such a great mod, thanks Staktup. I’ll be adding the skegs to our Oasis just for this towing benefit. Holy cow, friggin’ outboard! Sick stuff. Did you just add the 2 small skegs to the Adventure? Glad to hear it worked out, and that the sailing rudder comes stock on some models now. Did you just add the 2 small skegs to the Adventure? Yes, just the 2 small skegs as detailed in my earlier posts. Got my original adventure patched up now mainly for paddling duty. i am thinking of adding the skegs to this also and bolting different sized home made ones onto them(plating) just to experiment what effect different sized ones will have. I look forward to your testing results, WR. Old regular sized rudders might be good to cut down to try. One issue for large glued on offcenter fins is which way does the water flow. It probably isn't going parallel to the hull centerline, but it is probably mirrored left and right. 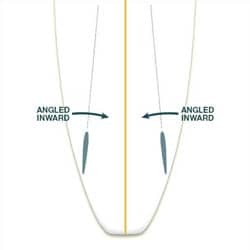 Fins parallel to the flow should balance forces and give straightening with least drag. The obvious approach of mounting parallel to hull centerline could give toe in or toe out snowplowing relative to water flow. It will still appear to work, but you could even glue tennis balls under the stern and get some caveman efficiency straightening effect. A solution for the retentive is to tape one end of bright yarn segments to the proposed glue points and aim an underwater gopro (clone) camera at indicated flow. The kayak depicted below is making a bet the water flow under the stern quarter is highly divergent in the horizontal plane, suggesting snowplow fins may be best. I think there is a rising flow in the vertical plane too, in case your fins don't go straight down and want to align to that too. A solution for the retentive is to tape one end of bright yarn segments to the proposed glue points and aim an underwater gopro (clone) camera at indicated flow. Reality is due to curve of hull and base pad of fins there is not a lot of area of adjustment. 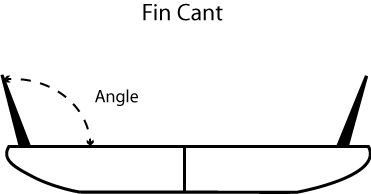 The spine of the fin is rigid and so can't follow the curve of the hull which would be required if you were to angle them as suggested.